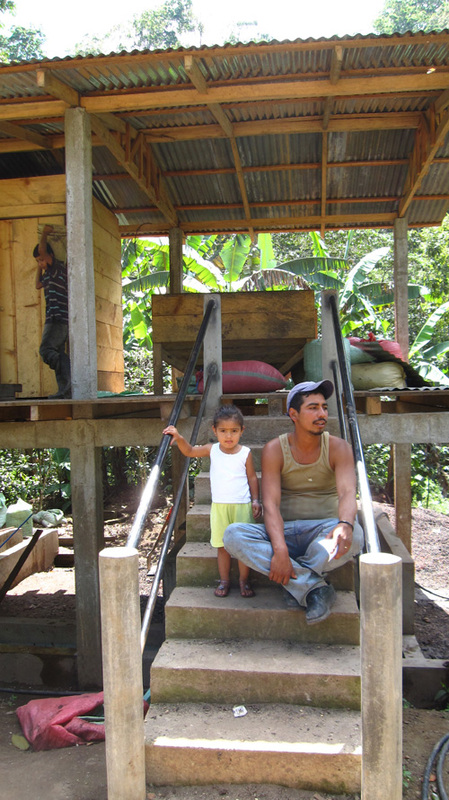 Remembering Nicaragua | Small Farmers. Big Change. « GMO Contamination of Maize: Crime Against Humanity? Fatima is eight months pregnant with her first child – a little girl. She is really excited to be a mom and we are waiting – the baby is due in the next couple of weeks. I gave her so many hugs while I was there, so send your good vibrations and wish her luck! 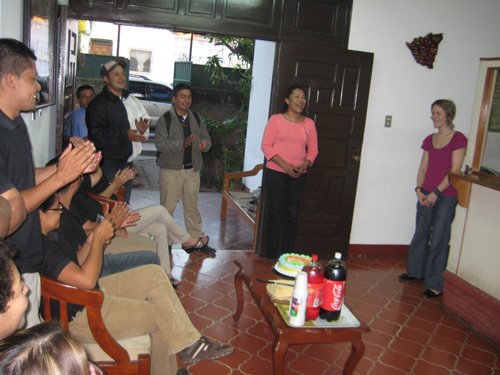 You probably also remember our super fun friend, Ligia Lopez, the Export Manager – her son Ian is now 2 1/2 as well. She has the energy of the energizer bunny and took me out with her to visit our friends in Jose Alfredo Zeledon to the town of Las Vegas. Check out Ligia and Alex sporting the cool new I heart my barista T’s available at the Equal Exchange Café in Boston. I got to spend some time with a few of our mutual friends a few weeks ago and here are some of the things that have been happening in the city of Las Vegas. I think pictures speak louder than words so here we go. I next caught up with Alcidez who brought us to the newly constructed wet beneficio. It was a really beautiful sight, complete with new cement fermentation tanks and a long washing channel. Gorgeous indeed. 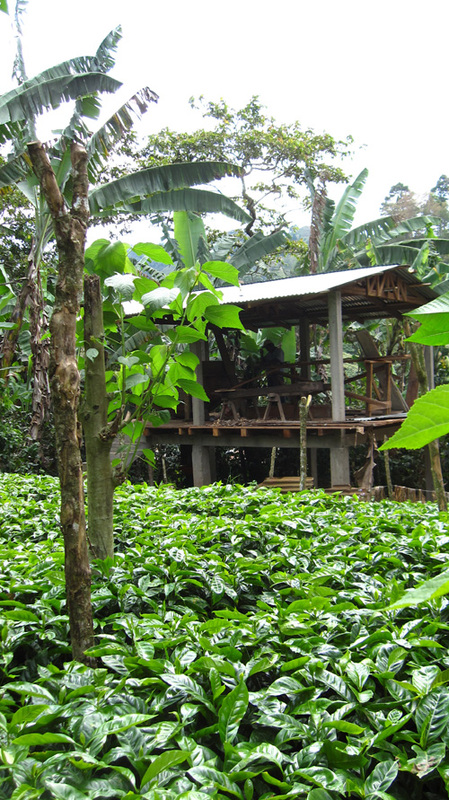 Not to mention the lush vivero (coffee nursery) that occupies the farm right next to the new beneficio. 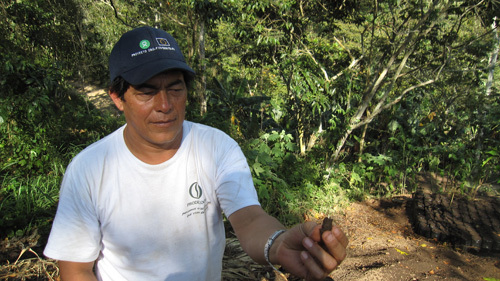 There were easily 1,000 Caturra trees ready to be planted in the coming months on his farm and other members of the co-op. JAZ is really encouraging members to renovate and create farm plans – necessary and important steps to produce fantastic coffee. 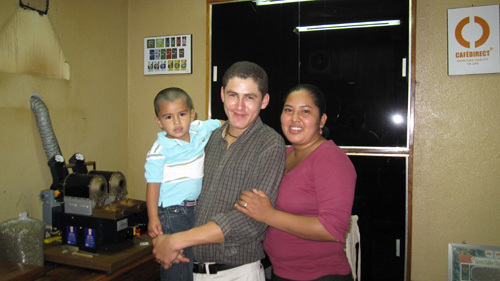 We walked down the road to check in with Francisco – for those of you that know him, you know that it is like pulling teeth to get him to talk. He was busy washing and drying the last bits from the harvest in his new (stunning, I must say) wet beneficio, complete with cement tanks and washing channel. Everything looked and smelled great. We walked down to the sediment pond where the honey water was slowly filtering through plants to its final resting pond and there I saw that some of the coffee trees were just starting to flower, which is always a good sign for the next harvest. I also found the always charming and very curious organic promoter, “Kenny,” at Francisco’s house in JAZ. He of course says “hello” to everyone! He remembers you guys and was reminiscing about the fun he had with some of you in 2007 at the local disco – Terry that one’s for you! I was able to spend a little bit of time with “Tacho,” the guy I like to say knows it all because he just seems to be a fountain of knowledge about anything and everything in San Juan del Rio Coco. Here he is showing us a small coffee seedling beginning to sprout from the new centralized coffee nursery they had built to support the renovation of coffee farms. I then headed over to Matagalpa to visit our partners CECOCAFEN and spent my 36th Birthday cupping coffee with my old friend, Julio, (he was part of the first Cooperation in Quality Seminar in 2004) and checking in with Celso and Ernesto from PROCOCER. This year’s harvest is especially delicious and it was clear to me that their work to improve quality and invest in additional storage for their coffee had yielded excellent results. I had never really spent my birthday at origin before and I was pleasantly surprised in the CECOCAFEN offices by Alvaro and Marta who thought it would be good idea to throw me a surprise birthday party! I walked into an office filled with the staff singing and clapping- which made me cry (of course). We finished our day with some great Mariachi music at the local Italian restaurant (I know it sounds weird – but this is a hot little touristy place with yummy food) and a little red wine to celebrate. For those of you that have journeyed south to spend time with our friends in Boaco, you will be happy to hear about a few of their successes in the last two years. 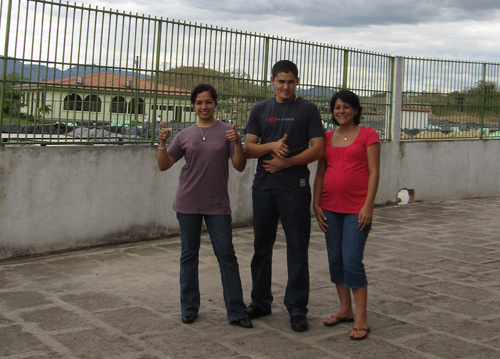 As Susan Sklar mentioned in her last post – the new beneficio is awesome! 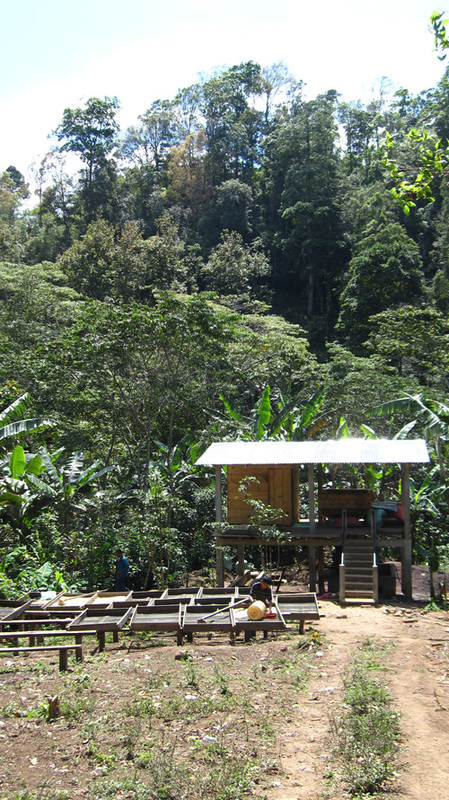 There is space for processing equipment, storage and a new cupping and roasting laboratory. 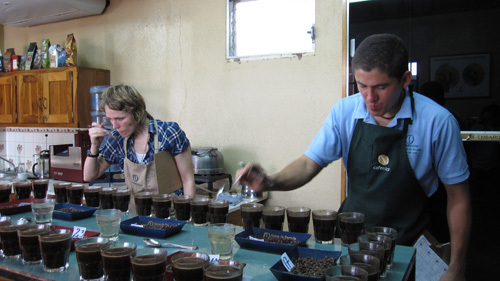 Not to mention, there are a few new faces, a young cupper named Jacqueline, a young agronomist named Ramiro (it’s always good to see the agronomists taking the time to learn how to cup) and the first female boss of the dry beneficio, Magdiela. The new and immense drying patio they have been hoping to construct was well on its way to completion and it will be a huge bonus for them in the next harvest. I just happened to be at Tierra Nueva the day before their annual meeting, so I got to hang out with the Board of Directors and share what is happening here in the U.S. and learn about their work in Boaco. Each of the Board members remembered delegations from years past and many of them asked when more people would be coming back! Coffee producers and the staff of the export coffee co-operatives that we do business with have really enjoyed getting to know many of you over the years. 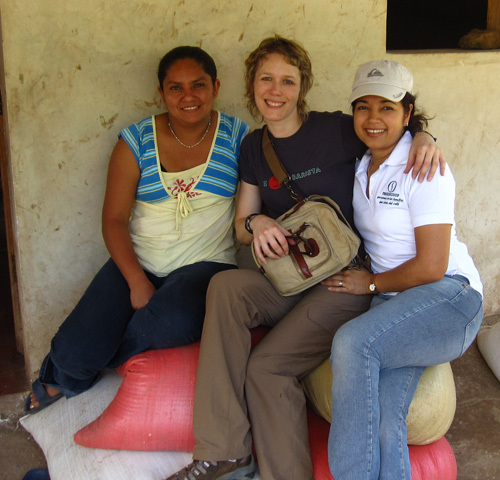 The power in connecting you with them is an experience that has helped the producers to know where their coffee is sold and why our work in sourcing delicious coffee is so important. We are a movement. Your visits and stories help to shape the way consumers think about our coffee and for this I say thank you. And on behalf of the coffee producers, I say thank you. Many thanks for this wonderfully interesting and informative post! It certainly helped me to understand more about the work of a quality manager in Equal Exchange and the all the fantastic people you get to work with! Also loved the photos! 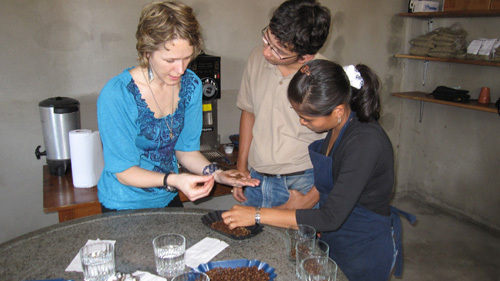 They offer a great view of your work context and the Nicaragua coffee growing environment! Your descriptions and the photos show a small/peasant farmer context that appears positive, happy, productive and successful. Is this the reality? If so can you give us some insights as to why this might be so and how is it different to so many of the stories we hear of small farmers caught in constant struggles for survival in a hostile WTO dominated agribusiness environment? Looking forward to many more stories of your travels and experiences! 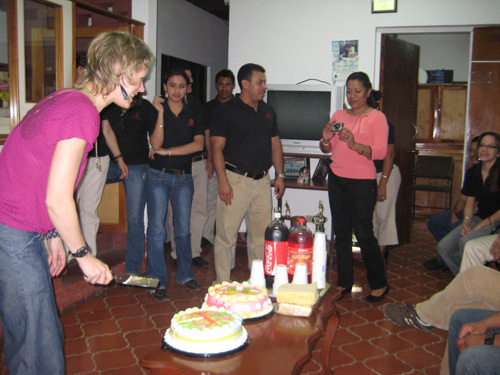 Thanks so much for your response about my recent trip to Nicaragua! As you can see, I had the opportunity to meet with so many great people- farmers and hired staff at the small farmer coops, amongst others. You ask some really good questions about the plight of small farmes and the reality of their day to day lives. Being a farmer isn’t easy and some of the people you saw in this post have endured because of their work and organization in their coop. 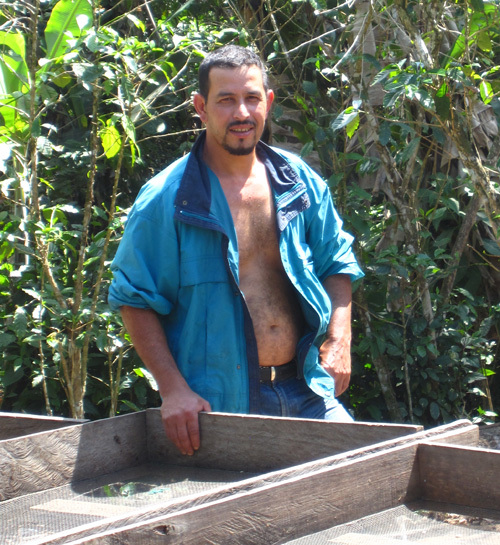 Jose Alfredo Zeledon requires each member of the coop to put in 5% of the price they are paid for coffee into a loan fund. The 2 new beneficios you see in this post are a result of this loan fund- a way to get micro-credit for farmers. These are only 2 examples of success in the community, but they have served as a model for other coop members and hopefully for other cooperatives to adopt in the future. 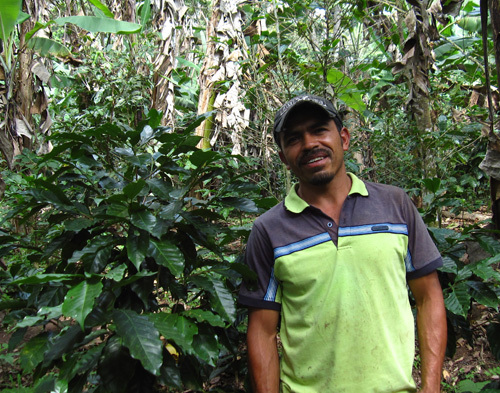 We know that not all is ‘rosy’ for many farmers in Nicaragua. The food crisis of 2007/8 & 9 have proven difficult. Everyone used to have access to affordable food- the cost of 3 tortillas used to be 1 Cordoba (about 5 cents) and now it is one tortilla for 1 Cordoba. Food prices across the board have gone up and many salaries remain the same. Small farmers are in a constant struggle- for access to credit, resources and covering the cost of production and although it is a glum picture, I hope to share some of the stories about people I know and that we work with and the power of the cooperative movement. I just returned from Mbale, Uganda (we will post about this trip too)- the sight of a recent landslide that killed hundreds of people- many of our producer partners were affected- Mount Elgon is home to thousands of people. Issues like erosion, poor farming practices and a lack of protection for environmentally degraded areas are just some of the problems- but I saw hope. Hope from the agronomists that I walked with. 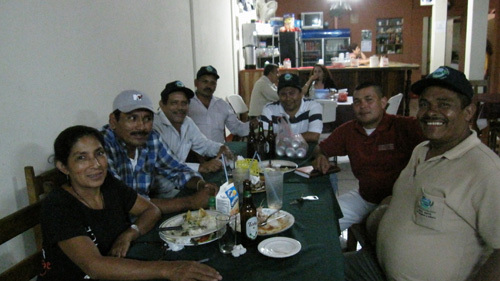 They are working and establishing training programs in coffee cultivation for cooperative members. I met super strong women struggling for equality in their own homes and their culture- but change is happening. These same strong women sit on their own boards of directors and train other women about their rights and resposibilities in the cooperative. The Gumutindo Coop is working to make this change happen through eduation and training- it is about committment and organization. It is a long slow road, but I am confident that we can all help to make this change. Small farmers big change is not a slogan for us- it really encompasses what we are trying to do. We know it isn’t easy, but we have to do our best to make it happen- and we will, because we are organized and committed. There are no easy answers, but I hope this helps us to continue our conversation. Many thanks for your prompt and comprehensive response to my questions. I now have a greater appreciation of the small farmers’ ‘reality’, how you see co-operatives as a vehicle for change. I sense though that if you aspire to ‘big change’ generated via co-operatives, it will require greater emphasis on the politicization of the cooperative movement and political change, rather than the emphasis you make on ‘technical’ change achieved through training and education. Something that I know Equal Exchange is already very conscious of.